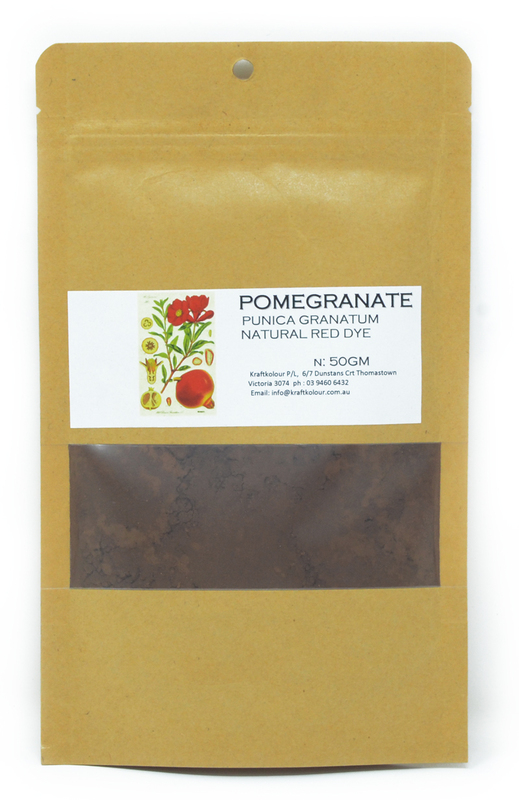 An extract or a powder from the rinds of pomegranates Punica granatum, this dyestuff is high in tannin and improves the light and wash-fastness of any dye with which it is mixed. In India and south east Asia it is used as both a dye and a mordant. Pomegranate yields soft yellows to green-yellows when used at 5-8% WOF for the extract (15 - 20% WOF for the powder) for a medium depth of shade. When combined with iron, pomegranate yields cement greys and deep moss greens. It is often mixed with the more turmeric dye to brighten the yellow and make it lightfast. Mordant with Alum at 15% WOF for protein and cellulose (there's enough tannin Pomegranate without adding more).